Many AmeriCorps Alums will be traveling to our nation’s capital this coming weekend January 19-21, 2013 for Martin Luther King Jr. Day of Service and the Second Inauguration of President Barack Obama. For all those in Washington DC, we would like to invite you to a special Happy Hour convened by AmeriCorps Alums from 6:00 – 8:00 pm on Friday January 18, 2013 at Cause – The Philanthropub to begin the MLK Day weekend of service and Inauguration weekend. Corporation for National and Community Service CEO Wendy Spencer, Serve DC Executive Director Jeffrey Richardson, and other Senior-level CNCS and national service celebrity guests will be in attendance. The event will be convening upstairs and registration is limited so make sure you RSVP for the event on Facebook. If you’re looking to serve, you can join DC and Baltimore Chapters of AmeriCorps Alums on January 19, 2013 at the Unite America in Service Event at the DC Armory, supported by Points of Light, Target, the Corporation for National and Community Service, Presidential Inaugural Committee, Operation Gratitude, Community Blueprint, Serve DC, HandsOn Greater DC Cares, Volunteer Fairfax and the George Washington University. Together they will impact the lives of 100,000 deployed U.S. Service Members, Wounded Warriors, Veterans and First Responders at this event. You can sign up to be one of 25 Alum leaders or to volunteer. 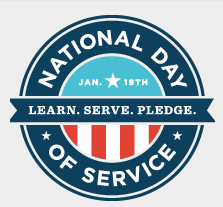 Also on January 19, 2013, The Corporation for National & Community Service with the Presidential Inaugural Committee will have current and alumni national service members serve as volunteers for the Service Fair on the National Mall. The Service Fair will serve as a kick off and frame the 2013 Presidential Inauguration Day of Service events. Attendees will get the opportunity to “Learn, Serve, and Pledge” with a diverse number of organizations present. Make sure to stop by the Service Fair and look for Alums and current members in bright colored vests sharing information about National Service on the National Mall.